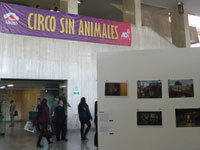 On June 12, 2013, members of the Colombian Congress were greeted with a huge ‘Circus without animals’ banner and underneath, our photographic exhibition. 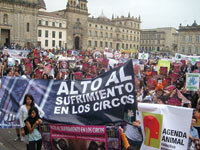 Then a six year campaign ended as the Colombian Congress banned wild animal circuses. Colombia is one of seven countries in Latin America, and the most populous and powerful to date, to introduce an animal circus ban. We worked hard to document the abuse and convince the Colombian public and politicians that animals do not belong in circuses. ADI investigators catalogued the deprived conditions, psychological suffering and the violent and brutal treatment of animals when being handled and trained. 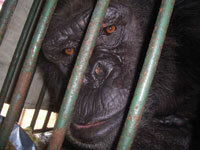 We exposed the abuse of elephants, tigers, horses, llamas, and an elderly female chimpanzee, Karla (below). Unfortunately, the original bill to ban all animals was amended by the Senate to exclude domestic animals and the transition period for implementing the law increased to two years, but the end is in sight for suffering wild animals. Now the hard work begins – ensuring that the new law is enforced. The circus industry, perhaps the most powerful in the region, has already tried legal challenges to existing local bans, without success. So we must defend this national ban at all costs. We need your support to ensure that, once the ban has been enforced, we can seize and relocate the animals! In August, El Salvador became the seventh Latin American country, and the second in Central America, to ban wild animals in circuses. The prohibition is part of a reform of the country’s wildlife conservation law banning shows featuring wild animals. This victory follows a campaign led by Circus Sin Animals in El Salvador, supported by ADI Latin America and local politicians Francis Zablah and Lourdes Palacios, as well as a number of key political parties including RENA, FMLN, GANA, PDC and PCN. A big congratulations, to all of our determined campaigners and partners across Central and Latin America!